(By James Giggacher, ANU Asia & Pacific, 28 March 2014) North Korea’s leader Kim Jong-un has again caught the attention of international media, but not for the usual sabre-rattling or Dennis Rodman roadshow he’s known for. This time it’s his hair that’s made the headlines. According to reports from Radio Free Asia, a state-sanctioned directive requiring male students to cut their hair in the same style as their leader has been rolled out across the Democratic People’s Republic of Korea (DPRK). The guideline was introduced in the capital Pyongyang two weeks ago. But in a place known for its secrecy and subterfuge, questions have been raised about whether the story is even true. According to North Korea expert Dr Leonid Petrov from the ANU College of Asia and the Pacific, it’s “nothing sensational at all”. “Back in 2004, the Democratic People’s Republic of Korea’s state TV launched a propaganda campaign called ‘Let us trim our hair in accordance with socialist lifestyle’,” says Petrov. “It recommended a relatively generous range of 28 hairstyles for its citizens, claiming that they are ‘the most comfortable’ styles and capable of warding off the corrupting effects of capitalism.” Petrov adds that young men were more restricted; their hair had to be less than five centimetres long and they were required to have a haircut every 15 days. The ‘socialist lifestlye’ haircuts are tied closely to North Korea’s philosophy of Juche, or self-reliance, which the regime uses to distance itself from ‘the West’. 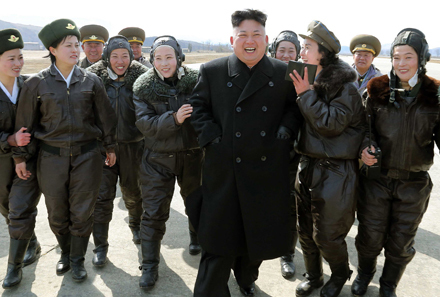 “And while North Korea enforces haircuts, some foreigners choose the Juche-style voluntarily,” says Petrov. So who knows; the next time the leader is in the media it may not be as agent provocateur, but rather for a perm. It’s a hair-raising issue either way you look at it.